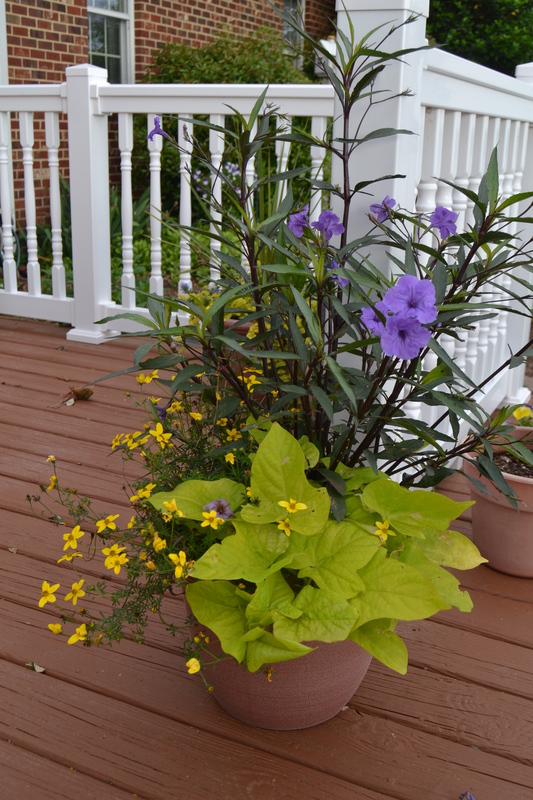 Mexican petunia, sweet potato vine and “Peter’s Gold Carpet”. Linking up to Wordless Wednesday. 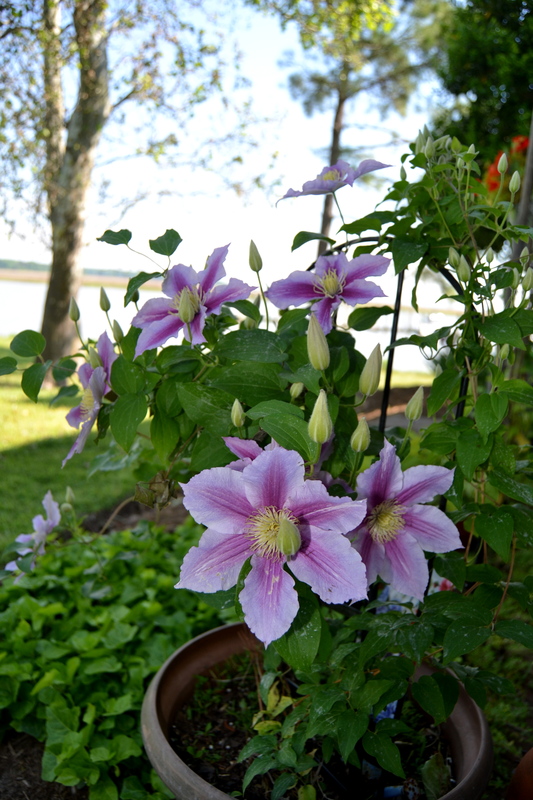 This entry was posted in Days at Home and tagged clematis, heirloom petunia, mexican petunia, nasturium, peters gold carpet, sweet potato vine, wordless wednesday. Bookmark the permalink. Beautiful! All that time at the various and sundry nurseries this year (!) has paid off – your flowers look VERY happy and I know you are too! 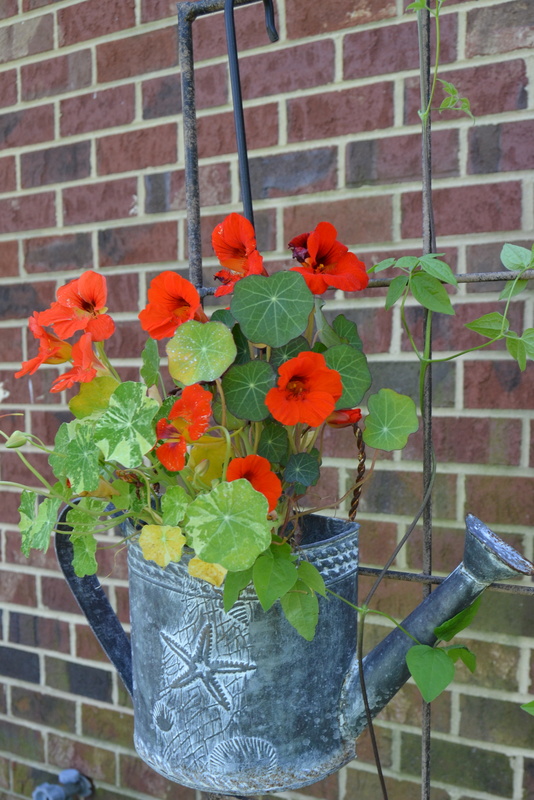 I love the vermilion orange of the nasturium and the water can planter, too! Still want to get over to see ‘what’s blooming’ in person. Love the original idea of the watering can planter. They’re all beautiful. I can’t remember a spring that has been so beautiful. Looks amazing in your world, too! Your green thumb is showing! Beautiful. My “That old Moss” is beautiful again this year in my tea kettle. Thanks again. Lovely Dianna! We hardly have anything blooming yet. But then I didn’t plant much this year in case drought decided to hang on, the squirrels digging up my petunias for the acorns and the deer eating the impatiens.. 🙂 I love the flowers and greenery around the garden flag you posted! Wonderful plant shots-and thanks for labeling. i am trying to do better on my plant names other than “purple and white flowers” Ha. Especially like the hanging watering can. A fine series of these pretty flowers. I too like the names since I know who few of the plant’s names. 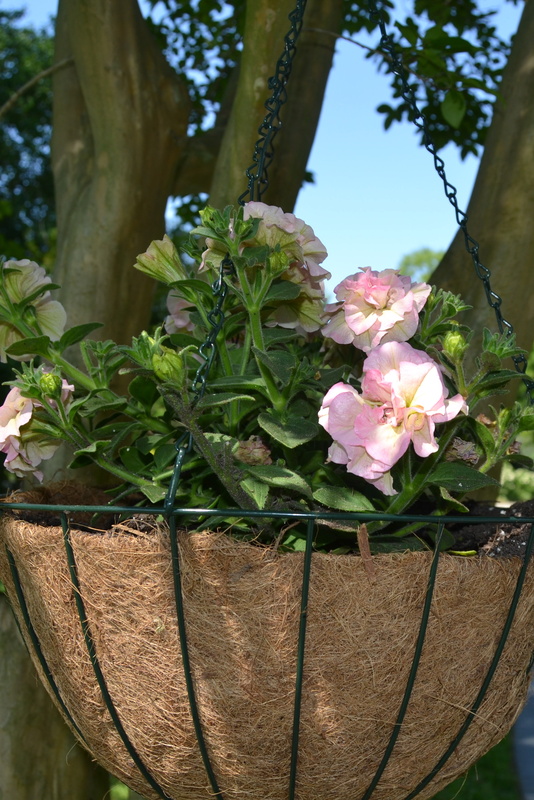 You’ve got a green thumb now…don’t cha? That’s a great combo in pic 1.. & I have a white clematis that’s looking decent right now .. I might have to try and replicate the first container—lovely! That’s what I forgot to plant! Nasturtiums! great combination of plants. Great job with all. Happy Wednesday. You have all kinds of creative arrangements, so pretty. Love that Clematis. No doves nesting in the hanging planter? Oooooh, I love the first photo! The colors are so vibrant!